Some advertisements I come across surprise me, sometimes for the right reasons and sometimes for the wrong reasons. Some ads are truly bold and hard hitting but others are bizarre. You will see what I mean, please read on, I picked up few that appeared in the press in the last 12 months. help a consumer check out as to where the product is available; I did check it out and found it quite useful; the company must make sure the store locator is updated periodically. Overall I think it s a good advertisement for a new product launch and not showing the pack shot was a bold decision. I did not know about Signoraware until I saw this press advertisement; I saw their TV commercial on YouTube though I don’t remember seeing it on television. This press ad primarily targets the end consumers at the same time it is also targets the trade since it mentions the name and phone number of their Sales Head. What is interesting is that it claims to offer a range of lunch boxes and storage containers which are of the best possible quality at half the price. But half of whose price? 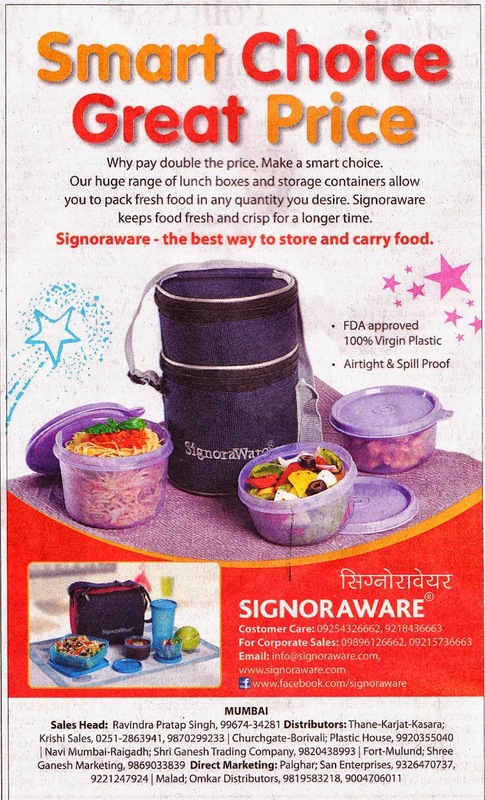 It seems obvious to me from this ad that Signoraware is being pitched against Tupperware. Tupperware’s claim to high quality is well known, it is also well known that prices of Tupperware products are exorbitant. I think it is a bold move on the part of a comparatively small brand like Signoraware to pitch itself against Tupperware, but they need to do much more than this if they establish the brand. 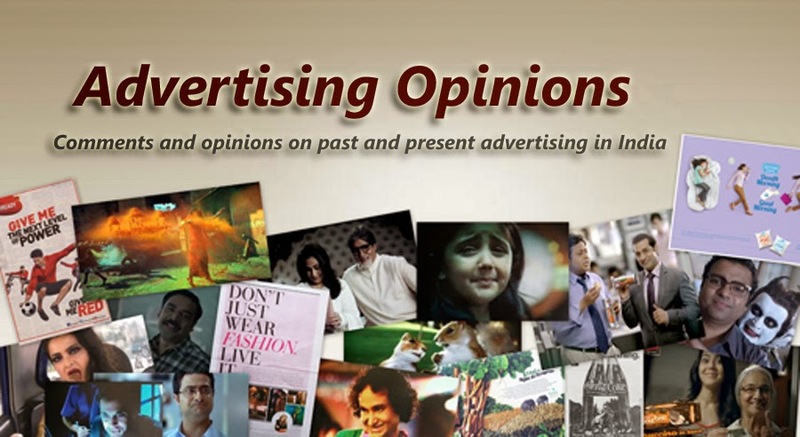 Signoraware needs to do sustained ad campaigns, a few stray ads here and there will not really help. 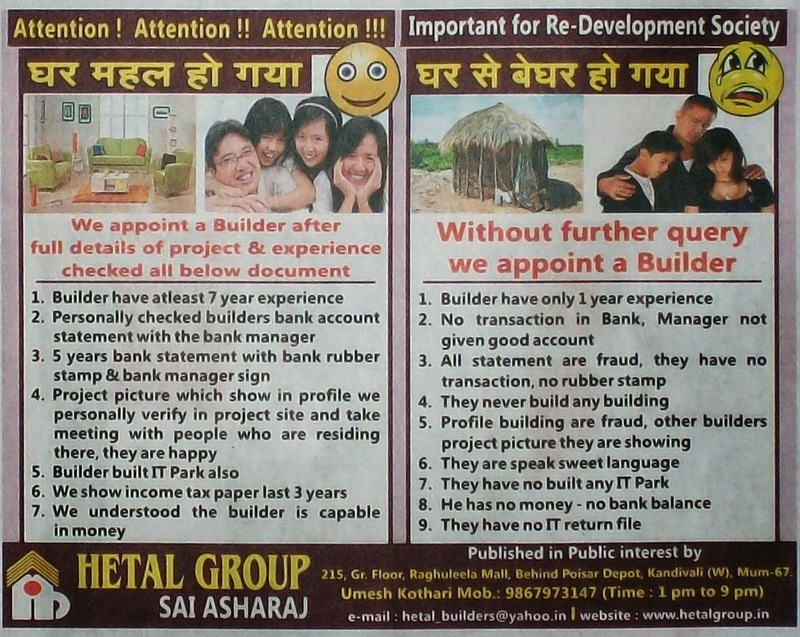 This press ad released by Hetal Group is supposed to be “published in public interest”. Ostensibly the advertisement is meant to caution housing societies who intend to redevelop their properties, what is unsaid is that Hetal Group is attempting to sell itself by telling its target audience that it is not like the other unscrupulous builders. This ad is a clever attempt but falls flat on its face for obvious reasons, you just have to read the copy. 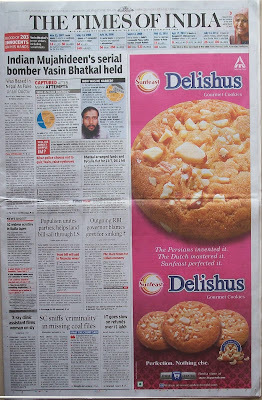 I wonder why the advertiser did not get someone who could write sensible copy in proper English for them. 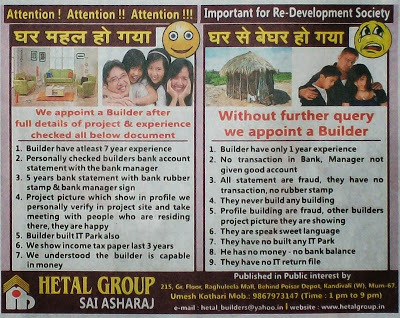 With an advertisement like this I wonder who would take them seriously, not too many I am sure. 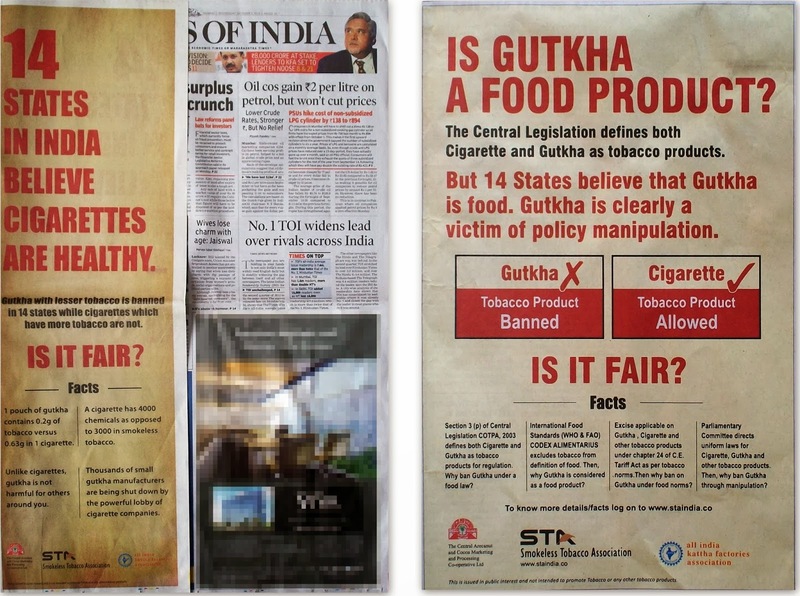 Smokeless Tobacco Association – Why ban gutkha? This is a two ad campaign by Smokeless Tobacco Association which is questioning the ban imposed on gutkha while cigarette smoking is permitted by law. I was shocked to see this audacious campaign. It is pretty well known that gutkha consumption is dangerous to human health, it is more harmful than cigarettes and other tobacco products. It is a bold attempt by Smokeless Tobacco Association to highlight their 'cause' but it is foolish to think that these ads will create any public sympathy. Kasara Ghat tragedy – Have a Good Day! This innovative advertisement has gone horribly wrong. 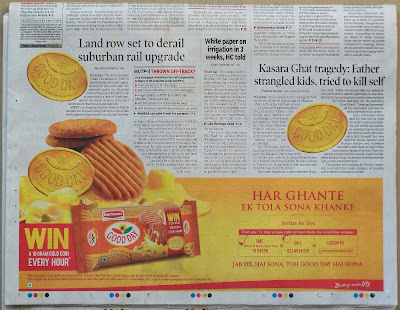 This ad appeared in The Times of India, Mumbai on November 13, 2012, when Britannia was celebrating 25 years of its highly successful brand Good Day. 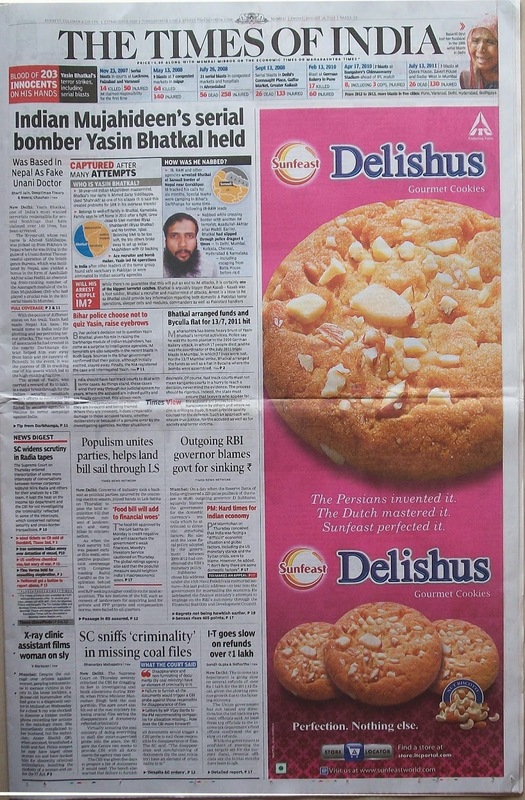 This ad is neither bold nor is it stupid, it is a good creative ad but a goof up did happen though inadvertently; the people who worked on the page layout simply worked mechanically, maybe one can’t blame them after all these guys at the press work under pressure. However the ad agencies and publications must devise some safeguards so that such disasters do not happen in future.